All human behaviour can be broken down into four basic emotions, according to research by Glasgow University. The study has challenged a commonly-held belief that there are six basic emotions of happiness, sadness, fear, anger, surprise and disgust. Researchers used a new technique and software programme, developed at the university, to examine expressions. They said fear and surprise shared the "signal" of wide open eyes, while anger and disgust shared a wrinkled nose. The team from the Institute of Neuroscience and Psychology claimed these early signals could represent more basic danger signals. Later in the signalling dynamics, facial expressions transmitted signals that distinguished all six "classic" facial expressions of emotion, they said. In comparison, the facial expression signals of happiness and sadness were clearly distinct across time. Lead researcher Dr Rachael Jack said: "Our results are consistent with evolutionary predictions, where signals are designed by both biological and social evolutionary pressures to optimise their function. Our research questions that human emotion comprises six basic categories. Instead we suggest there are four basic expressions of emotion. "What our research shows is that not all facial muscles appear simultaneously during facial expressions, but rather develop over time supporting a hierarchical biologically-basic to socially-specific information over time." In compiling their research, the team used special techniques and software to synthesise facial expressions. The Generative Face Grammar uses cameras to capture a three-dimensional image of people who have been specially trained to be able to activate all 42 individual facial muscles independently. 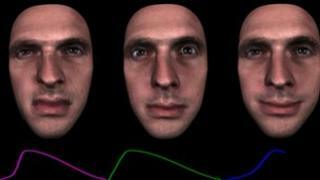 From this, a computer can then generate specific or random facial expressions on a 3D model based on the activation of different muscles - or Actions Units as researchers referred to them - or groups of units. By asking volunteers to observe the realistic model as it pulled various expressions - thereby providing a four-dimensional experience - and state which emotion was being expressed, the researchers were able to see which specific Action Units observers associated with particular emotions. Dr Jack said: "Our research questions the notion that human emotion communication comprises six basic, psychologically irreducible categories. Instead we suggest there are four basic expressions of emotion. "We show that 'basic' facial expression signals are perceptually segmented across time and follow an evolving hierarchy of signals over time - from the biologically-rooted basic signals to more complex socially-specific signals." She added: "Over time, and as humans migrated across the globe, socioecological diversity probably further specialised once-common facial expressions, altering the number, variety and form of signals across cultures." The researchers intend to develop their study by looking at facial expressions of different cultures. They said East Asian populations interpreted some of the six classical emotions differently - placing more emphasis on eye signals than mouth movements compared to Westerners.